Creative Assembly has announced a 12th playable faction for the upcoming Total War: Three Kingdoms, headed by hideous tyrant Dong Zhuo. 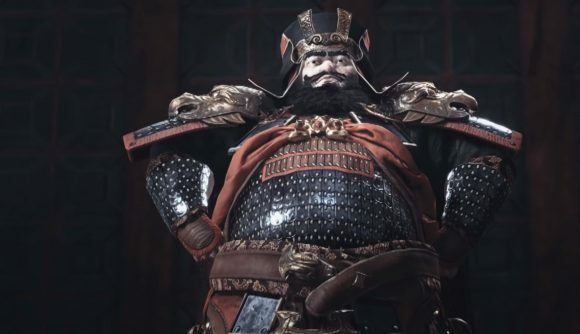 In a trailer released today, which you can check out further down this article, you can take a look at the new character, as well as his foster son, previously-announced faction leader Lü Bu. Dong Zhuo was a capable military leader in the late second century AD, who surreptitiously gained power until he was able to depose Emperor Shao and declare himself chancellor. Zhuo was deeply unpopular, but was able to quell an uprising against him. Eventually, he promoted himself to Grand Master, and became known for hideous methods of torture and the murders of all those who opposed him. Within two years, Dong Zhuo was responsible for the deaths of thousands of people. He also caused massive currency inflation by ordering commemorative statues to be melted down for coin to finance a personal castle. Eventually however, his tyranny caught up with him – in 192, he was assassinated by his adopted son, Lü Bu, who had been acting as a personal bodyguard. You can check out Dong Zhuo’s reveal (and some impressive spear technique from Lü Bu) in the video below. While you’ll be able to play as Dong Zhuo in-game, you won’t have access to him straight away. The tyrannical leader will appear once you defeat him in battle, although you won’t need to kill him, just defeat his army. You’ll also get access to him once you reach the rank of Emperor. The Total War: Three Kingdoms release date is pretty close now – you’ll only need to wait another month to head to Imperial China, and Rich’s is very excited. As he’s my boss, there’s a joke in here comparing him to Dong Zhuo, but as I’d like to keep my job, I’m not going to make it. That would be unprofessional.